The ruins of stone walls in the woodland behind the Église Sainte-Marie are the remains of a picturesque and whimsical recreational village built by the Eudist priests who taught at the university. 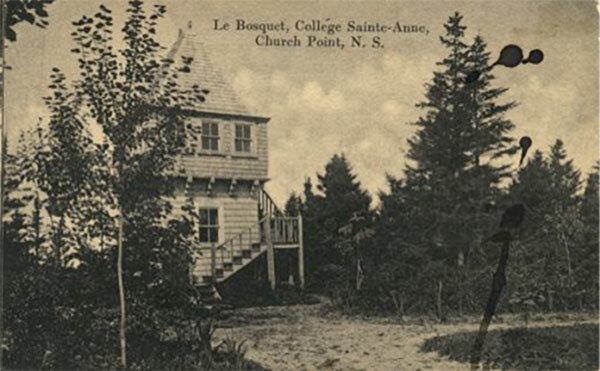 Rarely able to afford the trans-Atlantic ocean crossing to their homes in France, the teaching Fathers vacationed in Le Bosquet – ‘the grove’ – on the edge of the campus, investing it with their energy and creativity. 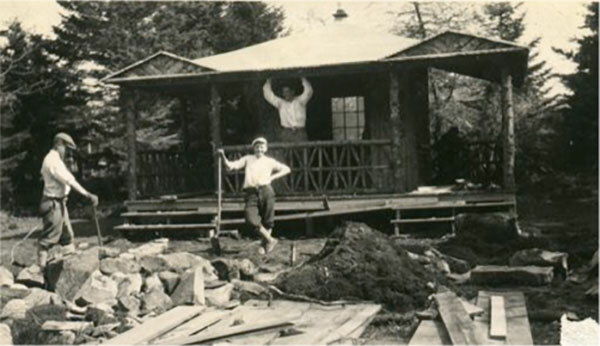 From the late 1890s to the 1940s, the Eudist fathers built primitive buildings, walking trails, gardens, ornamental twig fences and even some very substantial stone walls. 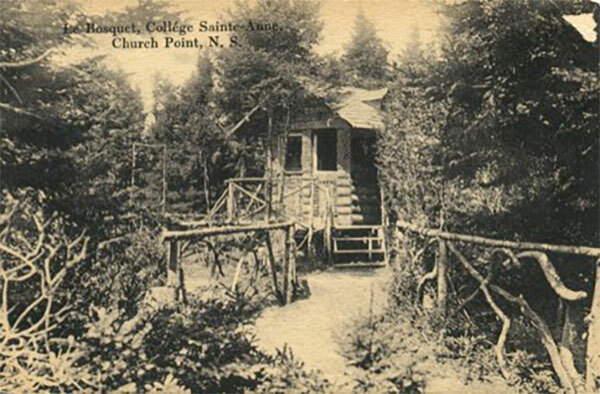 The priests built their own small cabins and spacious open-air pavilions with the help of the students of the college. 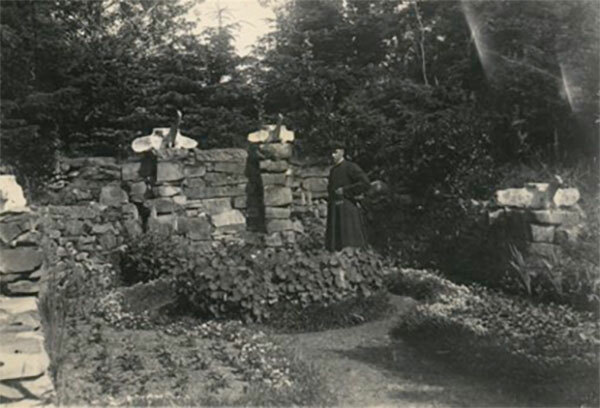 There were beautiful flower gardens enclosed with wooden fences and tall stone walls. It has been said that some of the priests imported their favourite flowers and shrubs from Europe, and some claim that a few of these exotic species can still be found in the woodland today. At its peak, the grove had a chapel, grottos with religious statues, a clay tennis court for summer, an outdoor skating rink for winter and a stately avenue lined with pillars linking it to the campus. The grove was a favourite spot for visitors. It was pictured on souvenir postcards and was often used as a backdrop for the college’s sports teams and club photographs. With the departure of the Eudist teachers, the vacation village fell into disrepair. Only the ruins of some of the stone grottos remain today.